The shift to online schools across the United States is undeniable. Just last week, Idaho became the first state to require two online credits for graduation— other states already require one online credit. Must read from Wall Street Journal provides a good overview of the strengths and pitfalls of the online classes movement. 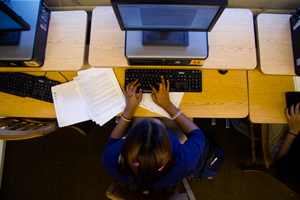 The biggest concern is the persistently low outcomes for children in fulltime online classes. We reported Colorado’s troubling study last month. The amount of teacher interaction varies. At online-only schools, instructors answer questions by email, phone or the occasional video conference; students will often meet classmates and teachers on optional field trips and during state exams. Southwest Learning Centers requires just 14 hours a week of classroom time and lets students set their own schedules, deciding when—or whether—to come in on any given day. And in Miami, students at iPrep Academy work in free-flowing “classrooms” with no doors or dividing walls but plenty of beanbag chairs and couches. Teachers give short lectures and offer one-on-one help, but most learning is self-directed and online. The drive to reinvent school has also set off an explosive clash with teachers unions and backers of more traditional education. Partly, it’s a philosophical divide. Critics say that cyberschools turn education into a largely utilitarian pursuit: Learn content, click ahead. They mourn the lack of discussion, fear kids won’t be challenged to take risks, and fret about devaluing the softer skills learned in classrooms. 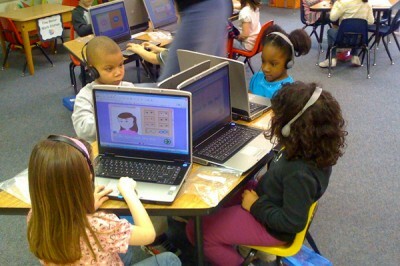 via Online Education: My Teacher Is an App – WSJ.com.